WILLIAM BRETT BAKER was born in Deal, in 1826. He was the son of the boatman Samuel Chamberlain Baker and his wife Elizabeth Brett, from Ticehurst, near the Sussex border. 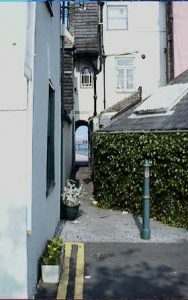 Primrose Hill was a very narrow street running from opposite the pier to Middle Street. William had an older brother, another brother having died before William was born, and two younger sisters. Deal was changing, to meet the demands of the 19th century. In 1832, the Gasworks opened. In 1834, the Deal Nautical School began to train boys to earn their living on the sea. We do not know if William and his brother attended this school. In 1836, the new Poor Law resulted in the closure of Deal’s two Poor Houses, in one of which William’s infant aunt Eliza had died in 1818. Instead, there was now the Eastry Union, serving a much wider area. The same year, the Waterworks opened. Like his father and his brother Samuel, William became a boatman. He would have earned his living by hovelling: supplying ships at anchor in the Downs, salvaging ships and equipment from the treacherous Goodwin Sands, providing spare chains, anchors, etc, to vessels which had lost their gear, and rescuing lives in the days before there was a lifeboat at Deal. Another source of income was taking off pilots from ships once they were safely headed down the Channel. In the 1841 census, William, aged 15, and his sister Elizabeth, 11, were living with their parents in Primrose Hill. Neither his brother Samuel nor his sister Mary was there. We do not know whether William was already a boatman. Only the occupation of the householder was given in 1841. In 1842, the Baker brothers, may have been, and their father almost certainly was, among the Deal boatmen who brought up the rear of a grand procession through the town to Upper Deal to welcome Queen Victoria, Prince Albert, and the young Princess Royal and Prince of Wales, who came to visit the town. The boatmen then lined the route with flags and torches. His father died in 1843, when William was 16. His widowed mother took in washing. In 1847, a branch of the South-East Railway from Minster to Deal was opened. Charles Dickens attended the celebration banquet. In the 1851 census, William and his brother Samuel were unmarried and living with their mother, still at Primrose Hill. His sisters were probably married or working away from home. SARAH ELIZABETH BUSHELL was the daughter of the boatbuilder Thomas Bushell and Sarah Frost. She was a few years older than William. She was born in Deal in 1824 and christened on 31 March. She passed her childhood as the third in a family of five girls. When she was 10, her first brother was born, followed by two more. In the 1841 census, she is probably the Sarah Bushell who is living in Lower Street with 65-year-old Ann Mewing, a greengrocer. Though her occupation is not given, she was probably a domestic servant. Her age, 17, was rounded down to 15. Sarah became a stay maker. She made cables, not corsets. Stays are the cables which hold a ship’s mast in place. Deal was famous for its hemp cable factories, though these, like her father’s occupation of boatbuilding, were now declining. Sarah may have made the rigging for some of the boats her father helped to build. We all went to London that afternoon, and finding two places in the mail, secured them. At our usual bed-time, Charley and I were rolling away seaward, with the Kentish letters. At last we came into the narrow streets of Deal: and very gloomy they were, upon a raw misty morning. The long flat beach, with its little irregular houses wooden and brick, and its litter of capstans, and great boats, and sheds, and bare upright poles with tackle and blocks, and loose gravelly waste places overgrown with grass and weeds, wore as dull an appearance as any place I ever saw. The sea was heaving under a thick white fog; and nothing else was moving but a few early ropemakers, who with the yarn twisted round their bodies, looked as if, tired of their present state of existence, they were spinning themselves into cordage. But when we got into a warm room in an excellent hotel, and sat down, comfortably washed and dressed, to an early breakfast (for it was too late to think of going to bed), Deal began to look more cheerful. Our little room was like a ship’s cabin, and that delighted Charley very much. Then the fog began to rise like a curtain; and numbers of ships, that we had had no idea were near, appeared. I don’t know how many sail the waiter told us were then lying in the Downs. Some of these vessels were of grand size: one was a large Indiaman just come home: and when the sun shone through the clouds, making silvery pools in the dark sea, the way in which these ships brightened, and shadowed, and changed, amid a bustle of boats pulling off from the shore to them and from them to the shore, and a general life and motion in themselves and everything around them, was most beautiful. In the 1851 census Sarah was again away from home, but only at the other end of the road in which her parents were living with the three boys. She was staying with the family of John Bayley. William Brett Baker and Sarah Elizabeth Bushell married in the third quarter of 1856. Their first child, William J., was born around 1857. A daughter Eliza A. followed two years later. By the 1861 census they were living at 19 Griffin Street. In the 1851 census, another Bushell family, millers, had been living at 18 Griffin Street. They may be relations, Also living with the young couple now were Sarah’s widowed father Thomas and her youngest brother William who, like William Baker, was a boatman. Sarah continued in employment after her children were born. Their 3-year-old son was already at school, though Sarah was illiterate. 1861 Census. 19 Griffin Street, Deal. In 1857, a Samuel Baker, publican and coachdriver, killed a customer with a poker for abusing his wife. He was transported to the West Indies. This was not William’s brother, but was probably a relation. Mr Henry Kingscote, then living in Sandown Terrace, pleaded the cause of the boatmen in the columns of the “Times”, and explained how it was that so many men were to be found on the beach. “The fact is that up to a comparatively recent period the Deal boatmen had a certain as well as an uncertain mean of livelihood. The certain means of subsistence I now, and for some time past has been, rapidly falling off. Before steam came to be applied, as it now is, so largely to our vessels, the occasion was rare and fortunate on which the shipping of the Port of London, whether outward bound or homeward bound, did not cast anchor in the Downs. The business of the Deal boatmen was to communicate with the vessels thus brought up. To the outward bound they carried off provisions, supplied the stores of which they might be found deficient, embarked passengers, many of whom preferred joining in the Downs to the tedium of a voyage down the river, shipped mail bag and parcels, &c. To the homeward bound vessels they rendered these and other additional services. The passengers generally desired to be landed at Deal. The ship’s letter-bags, especially those from Sydney and the West Indies, were almost invariably put ashore there. In consequence of casualties men were frequently wanted to work vessels up the Thames; even the cook’s grease formed an article of profitable barter or purchase. Both homeward-bound and outward-bound ships frequently lost or were obliged to slip an anchor whilst lying in the Downs, and it was a profitable occupation for the boatmen to sweep the roads for the recovery of these valuable articles. When the Downs were full of shipping every boat on the beach was occupied in communicating with the ships, and as the charges of the boatmen were in ample proportion to the service, the living they earned was by no means inconsiderable. John Laker, History of Deal, pp.397-8. Curiously, the following year proved an exceptionally profitable one for the boatmen, with salvage claims amounting to £10,000. This prosperity was probably never exceeded in any year before or since. First March 1862, 19 Griffin Street, Deal. Jane Bushell. Girl. William Brett Baker. Sarah Elizabeth Baker, formerly Bushell. Boatman. X The mark of Sarah Elizabeth Baker, Mother, 19 Griffin Street, Deal. Jane was baptised on 23 May 1862, in St George’s, in Lower Deal. St George’s had, from 1717, been a chapel-of-ease serving the boatmen of Lower Deal, since the parish church of St Leonard’s was in Upper Deal. In 1852, St George’s was licensed for banns, marriages, baptisms, churchings and burials, and became a separate parish church with its own registers. In 1863, there was another grand procession, this time to celebrate the wedding of the Prince of Wales. The North End and South End of Deal each had a boat and its crew mounted on a truck drawn by horses, with the boatmen from that end of the beach marching behind. 1864 saw the completion of a 1000ft iron pier. These are amongst the bravest and most skilful mariners that exist. Let a gale arise and well into a storm; let a sea run that might appal the stoutest heart that ever beat; the light-boat,on the Goodwin Sands, throw up a rocket in the night; or let them hear through the angry roar the signal guns of a ship in distress; and these men spring into action so dauntless, so valiant and heroic, that the world cannot surpass it. Cavillers object that they chiefly live upon the salvage. So they do, and God knows that it is no great living that they get out of the deadly risk they run. But put that hope of gain aside. Let those rough fellows be asked in any storm: ‘Who volunteers for the lifeboat?’ to save some poor perishing souls a poor as empty-handed as themselves, whose lives the perfection of human reason does not rate at the value of a farthing each, and that boat will be manned as surely and cheerfully as if a thousand pounds were told down on the weather-beaten Pier. For this, as for the recollection of their comrades who we have known, whom the raging sea has engulphed before their children’s eyes in such brave efforts, whom the secret sand has buried, we hold the boatmen of our watering-places in our love and honour, and are tender of the fame they well deserve. A further daughter, Lizzie, was baptised at St George’s on 4 May, 1866. The death of Sarah Elizabeth Baker was recorded in the second quarter of 1869. Her age was given as 45. In 1871 the widowed William was living in Middle Street with two of the children. 1871 Census. Deal. 159 Middle St. Neither Eliza nor Lizzie has been found in this census either. There is, however, a death for a Lizzie Baker, aged 10, in the third quarter of 1876. William Brett Baker died in the first quarter of 1879. None of this family appears in the 1881 census. It is possible that Jane Bushell, helping her uncle William Bushell, boatman and publican at the Napier Inn, is really William and Sarah’s daughter Jane Bushell Baker. This would fit well with what we know of her uncle, Sarah’s brother William Bushell. Deal parish registers, KFHS transcripts; 1851 Deal census. John Laker, History of Deal. T.F.Pain & Sons, Deal, 1917, pp.371, 375. Laker, p.395. For a fuller account, see 4. SAMUEL BAKER Manslaughter.